Elizabeth Ann Francis, 92, formerly of Harrisburg, entered into rest on Tuesday, February 19, at Frey Village Nursing Center, Middletown. She was born on June 8, 1920 in Strawn, Texas and was the daughter of the late Roy C. and Eunice Balch Mitchell. 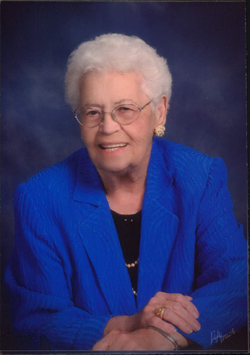 She was a retired employee with the U.S. Department of Defense; was a member of Middletown Presbyterian Congregation, Presbyterian Women’s Circle; and was past president of the Yellow Rose Club of Toastmistresses, Rio Grande Region, Texas. In addition to her parents, she was preceded in death by her husband John Francis on May 17, 1983. She is survived by two daughters Barbara F., wife of Allen Jacobs of Lower Swatara Township, and Beverly Boam, wife of Frank Shriver of Fresno, Calif.; twin sister Mary Anne Mitchell of Houston, Texas; brother Sandifer Mitchell of Houston; four grandchildren Stephanie Ponnett of Middletown, Andrew Jacobs of Phoenix, Ariz., Amanda Lung of Salt Lake City, Utah, and Brian Lung of Ft. Worth, Texas; and great-grandson John Ponnett III of Middletown. A Memorial service was held on Saturday at her church, with the Rev. Donald E. Potter officiating. Inurnment was at the convenience of the family in Fort Sam Houston National Cemetery, Fort Sam Houston, Texas. Memorial contributions may be made to Middletown Presbyterian Congregation, Union & Water Sts., Middletown, PA 17057.